IN THE LEDGE – What is the Premier hiding from the House on LNG deal? Question Period on Thursday, Oct. 4, 2018 between Liberal Leader Andrew Wilkinson and Premier John Horgan on the LNG project announced earlier this week. A. Wilkinson: It’s a fairly rare occasion when question period is the source of near unanimous applause. But this week we had a positive final investment decision, and that was made on the largest industrial project in Canadian history, which will come to fruition right here in British Columbia. Almost everyone in this House agrees on the benefits of this project and that this is in the public interest, but it also calls for some transparency and some accountability. 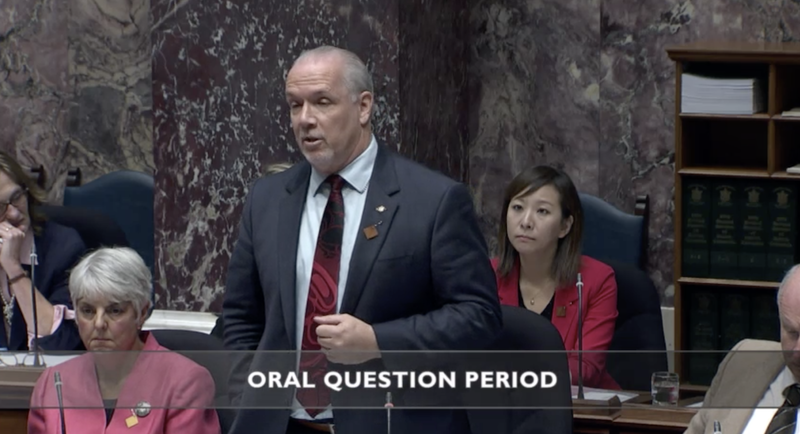 We heard yesterday, in the media, that the Premier has decided that in terms of disclosing the nature of this $40 billion transaction to the people of British Columbia, there’s no apparent need to bring it before the Legislature, which raises the question: why do we have a legislature? The Premier says he may or may not do that, in a fairly capricious exercise of executive power in a skin-of-its-teeth minority government. Why is the Premier reluctant to show the details of the LNG Canada deal to the elected members of this assembly when 90 percent of the House are firm supporters? Hon. J. Horgan: I thank the member for his question. Had he been paying attention in March, when we laid out our fiscal framework for LNG, he would know exactly what we’ve done and exactly what was agreed to and why we have a $40 billion investment in northern British Columbia. Unlike the previous government, we assume that industries, when they come to British Columbia — whether they be in the gas sector, whether they be in the forest sector, whether they be in the mining sector — and they’re purchasing electricity from our Crown utility, they would pay the same industrial rate. That’s what we’ve done. It’s very transparent, and the member should have known that. The approach on the other side was to say that this particular company, this particular sector, would pay more than anyone else in British Columbia for electricity. We rejected that. We’ve done that. We talked about it in March. I’m happy to talk about it again today. Mr. Speaker: The Leader of the Official Opposition on a supplemental. A. Wilkinson: It sounds as if the Premier is prepared to play one-card Monte and show the deck one card at a time, unlike proportional representation where he has completely stacked the deck. Now, we should…. Mr. Speaker: Members, if we may hear the question. Thank you. A. Wilkinson: We should review a bit of the history of this matter. Back in 2015, today’s Minister of Environment said: “It’ll be hard enough to meet our legislated greenhouse gas emissions targets. With LNG, it’ll be virtually impossible.” At that time, the now Minister of Energy had the wisdom to say: “This is the biggest sellout in British Columbia.” “This isn’t good for anybody in this province,” she said. It’s apparent that there has either been a dramatic change of heart on the government benches…. Perhaps the Green Party is kind of falling in line as well. Or perhaps the Premier can explain: why doesn’t he bring these matters before the House? Perhaps it’s because some of his ministers would be inclined to leave the room. Hon. J. Horgan: It’s extraordinary that the Leader of the Opposition’s charity lasted about 35 seconds. But nonetheless, he did demonstrate some earlier today, and the laugh line was pretty good as well, so I’ll give him full marks for that. But look, we’ve worked diligently since we came to government to ensure that we could land a significant investment decision that will benefit British Columbians right across the north and, in fact, in every corner of the province. I would have thought that that would been a time for celebration. Indeed, it is a time for celebration. Are there challenges? Of course there are. The focus of our government is going to be to make sure that we address those challenges. We have tabled targets for GHG reductions for 2030 and 2050, and we’re going to meet those targets. Mr. Speaker: Leader of the Official Opposition on a second supplemental. A. Wilkinson: I think the pattern is starting to emerge: the biggest transaction in Canadian history, entirely within British Columbia, taking British Columbia gas to tidewater for export, and the government of the day, hanging on by the skin of its teeth, doesn’t want it brought into this House. There is overwhelming support in this House for a good deal on LNG, so what is the Premier hiding? Why is he reluctant to bring it before the House? What is the accountability to this House? Or is this an executive Premier who has decided that he is above the law created by this House? Hon. J. Horgan: One level of accountability that springs to mind immediately is that we’re having a fall session of the Legislature to have these very discussions. Again, if there’s a requirement for legislation to implement this, the legislation will come before this House. There’ll be full and comprehensive debate, and we will proceed with the largest private sector investment in Canadian history.